Description: Surprise move by INLR has the combined "Lake County Champion" excursion train combined with the dinner train heading towards Mount Dora with the final rays of sunlight. Description: INRL 8330 is shoving the combined dinner & Lake County Champion trains towards Mount Dora with ex-MDLE 101 on the head end. Unadvertised & unexpected move, but provided non-backlit shots of ex-WRRX 8330 in its new paint. Description: What in BNSF H1 is this? 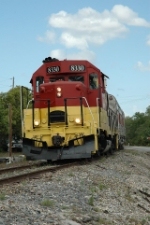 The latest incarnation of the Lake County excursion train is "Inland Lakes Railway", operating out of Mount Dora AND Eustis. Ex-WRRX 8330 has been painted in this BNSF-esque scheme & will eventually be lettered. Here, it's shoving the Lake County Champion back to Mount Dora. Description: Fresh out of the paint shop, ILRV 8330 prepares to pull the Easter Train excursions out of Mount Dora. Description: Not satisfied with the quasi-BNSF paint on 8330, the owner decided to apply this quasi-Rock Island job. Train is at US 441, half way between Eustis & Tavares. The rear car is the "Silver Bridle", ex-California Zephyr dome. Description: Lunch train has just left Eustis enroute Tavares. Ex-California Zephyr dome on the rear. Description: Lunch train pulling into the depot in Eustis. Description: Ex-California Zephyr dome "Silver Bridle" brings up the rear of the dinner train. 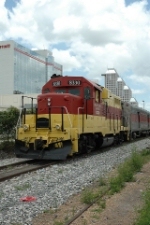 Description: This locomotive has worn three paint schemes since arriving in FL last year. Description: Departing the station southbound to Tavares. Description: The ex-California Zephyr dome was not yet in service when this shot was taken, which is just around the corner from Lake Jem park northbound to Eustis. Description: Engine has run around the train thru the siding & is about to head north. Description: Depending on how the train runs thru Tavares, where there is a wye, 8330 often leads "long hood forward". Description: "Railroad Ramblings" Excursion with the ex-California Zephyr dome "Silver Bridle" on its first revenue run, passing the junction of Toronto. Tracks used to cross at grade underneath overpass, but a connection track out of view behind the end of the train now gets trains to Winter Garden. 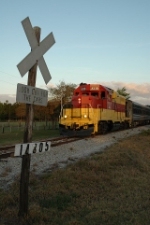 Description: "Railroad Ramblings" Excursion is headed northward towards Eustis & is only a couple miles away, about to cross US 441 aka "Orange Blossom Trail". 669 is on the rear in this shot. Description: Headed towards Mount Dora for a brief stop before passing back this way to Orlando. Description: It is almost impossible to get a perfect shot like this, skirting Lake Dora on the edge of historic Mount Dora. Train is making a rare morning appearance into town coming from Eustis. Trains generally operate from Mount Dora midday headed the other way & are backlit. Description: Train came down from Eustis & is headed for a brief stop in Mount Dora before continuing to Orlando. Seen here "street running" thru Tavares with ex-CA Zephyr dome Silver Bridle on its first revenue run. Description: Pulling into the north side of Lake Jem, one of the best shots on the line, for the photo runby. Description: Inland Lakes Railway is running their equipment back to Eustis after loaning it to FCEN for their 20th Anniversary Special. The "Wabash Pullman" behind the motor wasn't used, but is the newest addition to the operation, while the former MARC coach on the rear was dug out of storage in Plymouth before heading north. Description: At one point and time the Inland Lakes Railway operated a Bed & Breakfast type train with a 10-6 sleeper. I often found myself staying overnight due to short turnovers I had on the railway. I awoke one morning to find 8330 in the fog. I promptly got my camera out, set up, and turned on all the lights on the 8330. The result is this, taken at about 5:00am. Description: The Inland Lakes Railway Dinner Train rolls through Lake County on its way back to Eustis. Description: Easing past Wooten Park along Lake Dora. Description: Climbing up the hill past Lake Jem Park headed back to Eustis. Tracks run a small "roller coaster" tangent up here. Notice the rails below the locomotive's rear truck! Description: Northbound from Lake Jem. Sunset is 10 minutes away. Description: Train has just crossed US 441 "Orange Blossom Trail" headed southbound to Lake Jem. Description: ILRV 8330 is backing into Wooten Park with the "Thomas" train while FCEN 49 stays in the clear. This spot used to feature a citrus industry with a small street-running tangent. Description: One of ILRV's larget trains & largest events, seen here along Lake Dora at Wooten Park. Remnants of a short street-running tangent past a citrus packing plant can be seen below 8330. Description: 8330 prepares to head north out of Orlando on its return trip to Eustis. Description: ILRV 8330 preforms a photo runby near Lake Jem. Description: Memorial Day special for Inland Lakes Railway at the old Eustis depot. Description: Inland Lakes Railway ran a special to Orlando on Memorial Day. It is seen here approaching the station in Eustis to board passengers. Description: Train is actually southbound with 8330 bringing up the rear. The old tangent to the Forest City Branch can be seen mid-to-left in the image. Description: Street running towards Mount Dora. 8330 & train rarely run this way, usually turning to & from Eustis at Wooten Park behind the train. 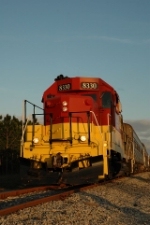 Description: Train is out of Tavares headed to Mount Dora. Only on special occasions does this lunch/dinner train set head out of Eustis this way. Description: Only when the stars align the right way is this shot possible. Normally, when trains do pass here later in the day, the sun has drifted to the other side of the lake. Description: Alternate view of the classic Lake Dora shot, now possible with vegetation cleared from RofW. FCEN has been busy cleaning up & improving the line. Description: Southbound from Eustis, just south of US 441 nearing Tavares enroute Lake Jem. Description: Five minutes into its trip over FCEN rails from Eustis to Lake Jem & back. Inland Lakes recently added a Thursday dinner train, so you can now catch this scene three times a week. Description: I had always wanted to try this, I'm happy with the way it turned out. This was on the Inland Lakes Railway dinner train. Description: Inland Lakes Railway and the Central Florida Chapter of the National Railway Historical Society operated a Eustis-Orlando round trip for President's Day. The train stopped at Robinson Street & passengers were taken by bus to Church Street Station, which is experiencing a rebirth with the reopening of Cheyenne Saloon. Description: Inland Lakes Railway and the Central Florida Chapter of the National Railway Historical Society operated a Eustis-Orlando round trip for President's Day. The train stopped at Robinson Street & passengers were taken by bus to Church Street Station, which is experiencing a rebirth with the reopening of Cheyenne Saloon. Here, the train has stopped at FCEN's Plymouth Yard office. Description: Inland Lakes Railway extra passing some Florida oranges, which are still grown in Lake County.